This paper reconsiders the problem of market power when generators face a demand curve limited by a transmission constraint. After demonstrating that the problem's importance originates in an inherent ambiguity in Cournot-Nash theory, I review Oren's (1997a) argument that generators in this situation capture all congestion rents. In the one-line case, this argument depends on an untested hypothesis while in the three-line case, the Nash equilibrium was misidentified. Finally, the argument that financial transmission rights (and TCCs in particular) will have zero market value is refuted by modeling the possibility of their purchase by generators. This allows transmission owners, who initially own the TCCs, to capture some of the congestion rent. In fact when total capacity exceeds line capacity by more than the capacity of the largest generator, TCCs should attain their perfectly competitive value, thereby curbing the market power of generators. This paper explores the sources and magnitude of energy-inefficiency in the electricity generating sector in India and its implications for carbon emissions from this sector. An econometric methodology is developed to disaggregate and quantify the contribution of technical and institutional factors to this inefficiency. The analysis demonstrates the potential for institutional and economic policy reforms that provide incentives for the adoption of efficiency-enhancing production practices to reduce carbon emissions while increasing net electricity generation, even with the existing capital equipment. 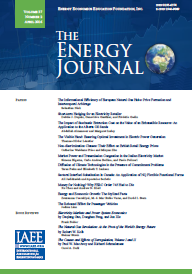 This paper examines the political and economic underpinnings of gasoline tax policy. The theoretical model extends the earlier work of Hettich and Winer (1988) to flush out the effect of a change in the pre-tax price of a taxable activity on the politically optimal tax rate. Using a large cross-sectional sample of U.S. states over 1960-94, the empirical model tests the predictions of the theoretical model within the context of the state tax policy on gasoline. While simultaneously controlling for other politico-economic influences, we find that the influence of changes in gas prices on tax rates is negative. To our knowledge, this is the first study to include a fully developed theoretical model and its empirical application to the gasoline market for a test of the votemaximizing model of tax policy. Estimates of the marginal costs of greenhouse gas emissions are an important input to the decision how much society would want to spend on greenhouse gas emission reduction. Marginal cost estimates in the literature range between $5 and $25 per tonne of carbon. Using similar assumptions, the FUND model finds marginal costs of $9 23/tC, depending on the discount rate. If the aggregation of impacts over countries accounts for inequalities in income of 3. Marginal costs per region are an order of magnitude smaller than global marginal costs. The ratios between the marginal costs of CO2 and those of CH4 and N2O are roughly equal to the global warming potentials of these gases. The uncertainty about the marginal costs is large and right-skewed. The expected value of the marginal costs lies about 35% above the best guess, the 95-percentile about 250%. In this paper we test for deterministic chaos (i.e., nonlinear deterministic processes which look random) in seven Mont Belview, Texas, hydrocarbon markets, using monthly data from 1985:1 to 1996:12--the markets are those of ethane, propane, normal butane, iso-butane, naptha, crude oil, and natural gas. In doing so, we use the Lyapunov exponent estimator of Nychka, Ellner, Gallant, and McCaffrey (1992). We conclude that there is evidence, consistent with a chaotic nonlinear generation process in all five natural gas liquids markets. This paper demonstrates that models which combine the physical reserves of oil with economic and regulatory variables provide better forecasts of future production than models based on either reserves or economic variables alone. Four alternative models are specified and estimated. Out-of-sample forecasts show that a model combining reserves, lagged production, and the real price of oil performs much better than models based on reserves alone or economic variables alone. This paper extends the tests of Weiner's (1991) regionalization hypothesis in Gillen (1997), which employed monthly data, to weekly data from a more recent period (1991:4-1996:52). The higher frequency data allows us to analyze the co-movement of prices for similar quality crude oils from different regions of the world in shorter periods of time. In addition to the full sample, two subperiods (one of falling prices, 1991:4-93:52 and the other of rising prices, 1994:1 96:52) are analyzed. The results are usually similar to those from Gillen (1997) which rejected regionalization, but the comparison of the two subperiods leads to some interesting conclusions. First, prices (including that of Saudi Arabian Heavy) appear to be more in line with each other during tight market conditions than during weak market conditions. Second, the global benchmark role of WTI and UK Brent is reinforced. From oil, to natural gas, and now electricity, the regulation of energy markets has been successively restructured to allow greater scope to market forces. The likely next domain for restructuring, environmental regulation, may seem far fetched now, but it is no more so than the restructuring of electric utility regulation would have seemed to be twenty years ago. The "grand experiment" with emissions trading under the U.S. acid rain program has set a propitious example by showing that markets in environmental goods can be constructed and that the explicit recognition of property rights in the use of the environment is compatible with effective and non-intrusive environmental regulation.